Mr 'Hammer' Stannett was for many years the Lammas hayward. 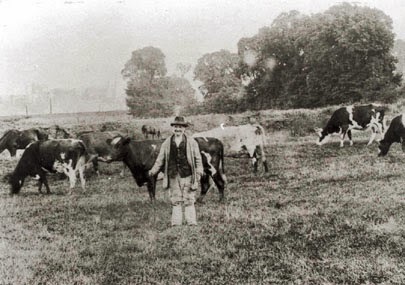 He is pictured here minding cows and horses on South Field. Windsor Castle is in the left background, and the 'Chinese Bridge' and river just out of the picture on the right. The hayward grazed the cattle over Lammas lands from the commons, the Slads, Eton Wick Recreation Ground, South Field and back home. The milking herds have virtually all gone, and with them the hayward, but residents still benefit from the rural legacy of open fields all around them, as Eton and Eton Wick are virtually surrounded by Lammas or common land, preventing urban sprawl. A similar photograph of 'Hammer', has featured in a number of county and national publications. Haywards Mead housing development was named after the hayward. Just wondered if anyone knew what Hammer Stannett's real name was. Not sure if it's Henry or George.